With the arrival of fall and with winter approaching, our seasonal fruit and vegetable options here in Wisconsin become less and less. This is the time of year when comfort foods seem a lot more tempting and our access to fresh ingredients is minimized. Staying on track with proper nutrition becomes difficult, and it’s not surprising. Your health, however, should be just as important to you throughout the cold months as during the summer. Cozy clothes, grey skies and dropping temperatures make it difficult to find motivation to exercise, prepare healthy meals and keep your spirits high, but these aspects of a healthy lifestyle are all in your control. Remember the idea of choice I wrote about often throughout the summer? That definitely still applies and even becomes more relevant when our general motivation is low. 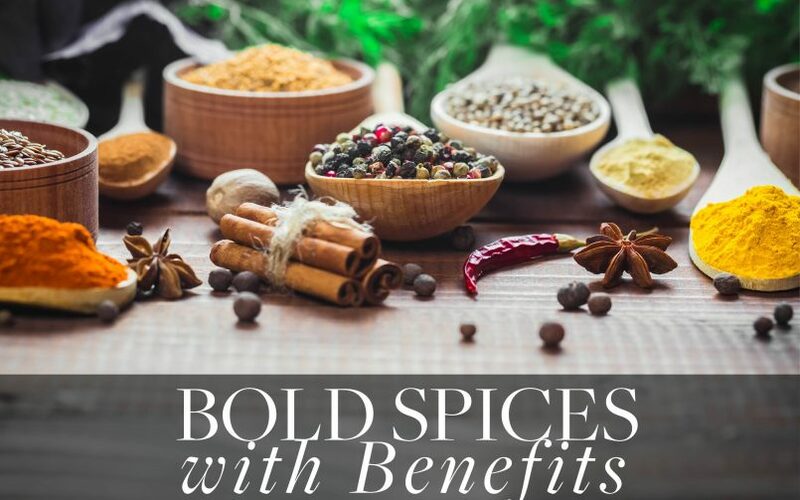 This fall and winter, use spice blends and new ingredients to your advantage. Fresh and dried spices have surprising health benefits and are incredibly versatile, providing you with endless combinations. Keep your recipes fresh and unique by adding different flavors and trying these meals from different parts of the world. What makes cayenne and other peppers hot is a substance called capsaicin. Capsaicin is actually therapeutic and helps relieve soreness and body aches. Also, you boost circulation by ingesting capsaicin, which improves heart health. Added benefits include higher defense against prostate cancer and stomach ulcers. Spice up your dishes with even just a small sprinkling of cayenne pepper. Add it to chili recipes, use it to liven up ground turkey, or even dash it on sautéed vegetables. Looking for new recipes for the week that include cayenne pepper? Opt for South American or Latin dishes, but be wary of the amount of cheese in them. Select dishes with lots of vegetables, chicken and ground turkey. Tumeric is a spice that is popular in Middle Eastern dishes (i.e. Indian food). Tumeric has anti-inflammatory properties, making it an all-around excellent addition to your weeknight recipe routine. Curcumin, tumeric’s main ingredient, is a super powerful antioxidant and anti-inflammatory agent. By lowering your body’s inflammation levels, you lower the risk of many ailments, including arthritis, joint pain and headaches. Use turmeric in flavorful Indian dishes like curry meatballs, spiced lamb and yoghurt sauce, or even miso-tumeric dressing for salads. Tumeric is also great to use in a blend of spices with sautéed vegetables as a quick side option for dinner. The more colorful, the better! Ginger is a root that can be consumed in various forms and packs a plethora of benefits. Ginger can soothe upset stomachs, ease bloating and alleviate a sore throat. Most commonly, you find ginger on the ingredients list for an Asian recipe. Think stir fry, sushi or sautéed veggies. You can even consume ginger as a tea, which offers an even higher concentration of this powerful ingredient. Next time you’re looking to quell any cold symptoms or just boost your body’s gastrointestinal functions, opt for a recipe with ginger. The key to keeping it light, however, is to stay away from fried foods in your stir fry and aim more for sliced chicken, pork, beef and plenty of vegetables. Cinnamon is very popular in the fall and winter months, but I rarely see it used in healthy recipes. This is surprising because cinnamon itself is a wonderful antioxidant that helps lower inflammation, aid in fat burning and lower blood sugar. This warm, savory spice is perfect for making healthy foods a little more comforting. Add a little to fruit smoothies, atop Greek yogurt, cottage cheese or stir it into peanut butter. You can also sprinkle it on sweet potatoes, another great food to feature in the colder months. Basil is a flavorful, leafy plant that packs some serious antioxidant power. It can protect the body from premature aging and various skin conditions because the plant’s pigment actually protects your cells from environmental damage. The properties of oregano are strikingly similar, and the flavor of the two together is ideal for Italian dishes or flavorful salads. The only downside with these two ingredients is that the leafy, fresh form is difficult to harvest in the fall and winter months. You can grow your own indoor plant, but you could also sacrifice some of the health benefits by opting for the dried versions in the supermarket aisle. Fresh basil and oregano leaves are great additions to salads, whole grain pasta dishes and stuffed chicken breasts or peppers. You can use dried basil and oregano in the same way or simply by sprinkling them over salads, sandwiches and pasta dishes. Stay aware of your nutrition this winter by featuring new, bold spices. Branch out from your usual comfort foods and borrow some dishes from around the world! And when you really can’t resist your warm comfort dish, feel free to give in but remember: moderation is key.